Our goal at Google Cloud Platform (GCP) is to be the best enterprise cloud environment. Throughout 2016, we worked hard to ensure that Windows developers and IT administrators would feel right at home when they came to GCP: whether it’s building an ASP.NET application with their favorite tools like Visual Studio and PowerShell, or deploying the latest version of Windows Server onto Google Compute Engine. Continuing our work in providing great infrastructure for enterprises running Windows, we’re pleased to announce pre-configured images for Microsoft SQL Server Enterprise and Windows Server Core on Compute Engine. High-availability and disaster recovery are top of mind for our larger customers, so we’re also announcing support for SQL Server AlwaysOn Availability Groups and persistent disk snapshots integrated with Volume Shadow Copy Service (VSS) on Windows Server. Finally, all of our Windows Server images are now enabled with Windows Remote Management support, including our Windows Server Core 2016 and 2012 R2 images. You can now launch Compute Engine VMs with Microsoft SQL Server Enterprise Edition pre-installed, and pay by the minute for SQL Server Enterprise and Windows Server licenses. Customers can also choose to bring their own licenses for SQL Server Enterprise. 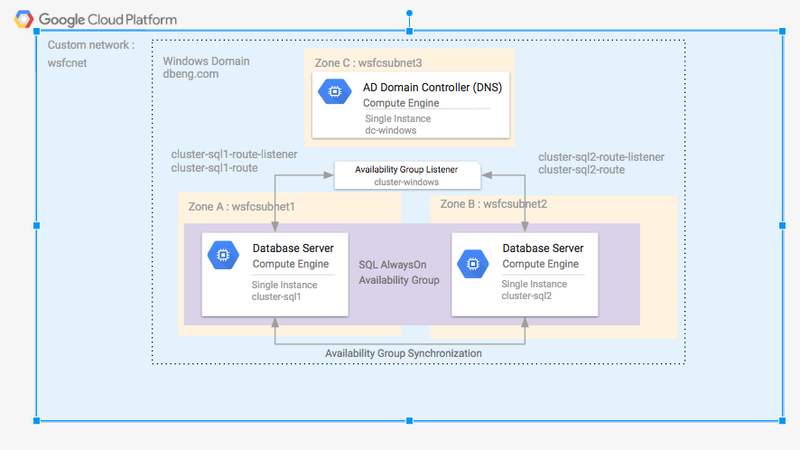 Combined with Google’s world-class infrastructure, SQL Server instances running on Compute Engine benefit from price-to-performance advantages, highly customizable VM sizes and state-of-the-art networking and security capabilities. With automatic sustained use discounts and the prospect of retiring hardware and associated maintenance on the horizon, customers can achieve total costs lower than those of other cloud providers. 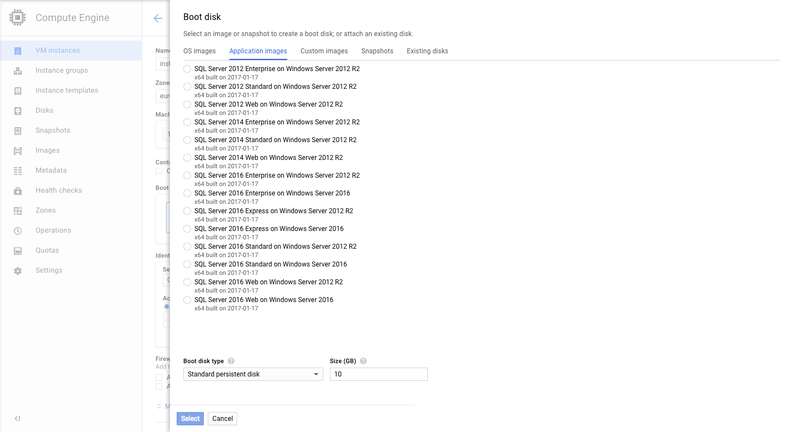 To get started, learn how to create SQL Server instances easily on Google Compute Engine. Mission-critical SQL Server workloads require support for high-availability and disaster recovery. To achieve this, GCP supports Windows Server Failover Clustering (WSFC) and SQL Server AlwaysOn Availability Groups. AlwaysOn Availability Groups is SQL Server’s flagship HA/DR solution, allowing you to configure replicas for automatic failover in case of failure. These replicas can be readable, allowing you to offload read workloads and backups. Compute Engine users can now configure AlwaysOn Availability Groups. This includes configuring replicas on VMs in different isolated zones as described in these instructions. Being able to take snapshots in coordination with Volume Shadow Copy Service ensures that you get application-consistent snapshots for persistent disks attached to an instance running Windows — without having to shut it down. This feature is useful when you want to take a consistent backup for VSS-enabled applications like SQL Server and Exchange Server — without affecting the workload running on the VMs. 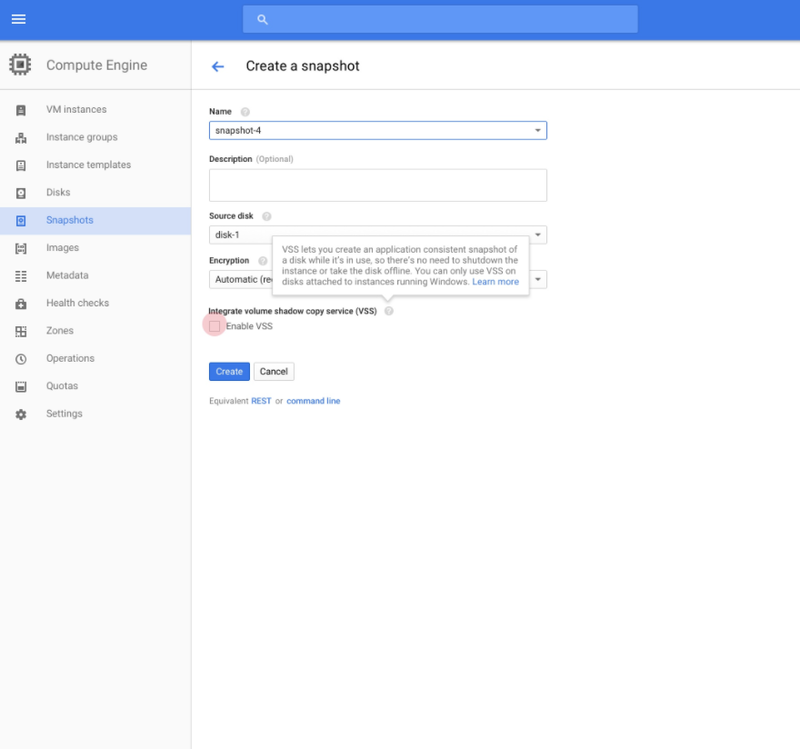 To get started with VSS-enabled persistent disk snapshots, select Snapshots under the Cloud Console Compute Engine page. There you’ll see a new check-box on the disk snapshot creation page that allows you to specify whether a snapshot should be VSS-enabled. This feature can also be invoked via the gcloud SDK and API, following these instructions. GCP’s expanded support for SQL Server images and high availability are our latest efforts to improve Windows support on Compute Engine, and to build a cloud environment for enterprise Windows that leads the industry. Last year we expanded our list of pre-configured images to include SQL Server Standard, SQL Server Web and Windows Server 2016, and announced comprehensive .NET developer solutions, including a .NET client library for all GCP APIs through NuGet. We have lots more in store for the rest of 2017! For more resources on Windows Server and Microsoft SQL Server on GCP, check out cloud.google.com/windows and cloud.google.com/sql-server. And for hands-on training on how to deploy and manage Windows and SQL Server workloads on GCP, come to the GCP NEXT ‘17 Windows Bootcamp. Finally, if you need help migrating your Windows workloads, don’t hesitate to contact us. We’re eager to hear your feedback!